< Click on her picture for biog. in wikipedia. 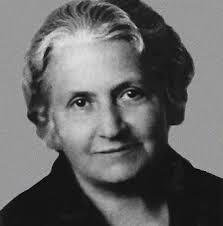 Montessori essentially found - by experience - that action-learning is a better method for learning than the industrial-type educational system, but she was not in her time (in the 1800s) in a position to propose, or even perhaps imagine, a society without schools - which is the logical conclusion of action-learning being our natural (& therefore most effective) learning model. Her 'method' has an underlying theory based on learning being a process that unfolds & is directed from within the person, who actively searches for the input from the environment that she needs in order to develop to her full potential. She is one of the earliest industrial education innovators who realized the 'traditional' education system does not serve human intelligence.